Fido & Wino » Merry Christmas Mickey! 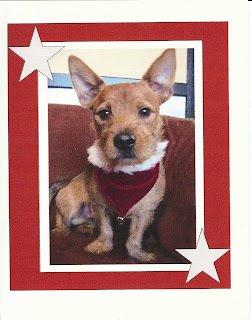 Here we have a crooked scan of the Christmas card the puppy daycare took of Mickey on Christmas Day. I know, horridly unprofessional (a scan… gasp! )- but I just had to include this picture. What kind of mom would I be to include a Christmas picture of the black and white one, without including a Christmas picture of the brown one? I’d start getting feedback that I was racist, I am sure. Will you look at the PAWS! They are TURNED OUT people! He looks slightly concerned, his head looks way to big for the rest of him and I am sure he is aware that he is not quite pulling off that little ‘kerchief. Classic. Love it.